What Toggl Triggers and Actions Are Supported? New Project - Triggers when new projects are added. New Time Entry - Triggers when a new time entry is added. New Time Entry Started - Triggers when a new time entry is started and running. New Tag - Triggers when new tags are created. New Task - Triggers when new tasks are added. Create Client - Creates a new client. Create Project - Creates a new project. Stop Time Entry - Stops an existing time entry. Create Time Entry - Creates a new time entry. Start Time Entry - Starts a new time entry. Find Project - Finds a project by name. Find Time Entry - Finds a time entry by description. Find Client - Finds a client by name. Find Tag - Finds a tag by name. Find Task - Finds a task by name. 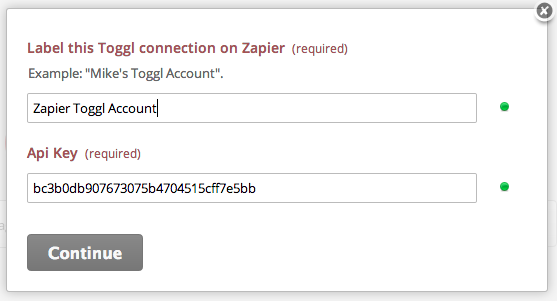 To get started with Toggl, first click to add a Toggl account in your zap. Then, you'll need to name your Toggl Account on Zapier and provide your Toggl API Key. The name field is only for identifying your Toggl Account inside Zapier. It can be whatever you want. This is helpful if you need to connect multiple Toggl accounts to Zapier. You can find your Toggl API key by navigating to the bottom of your Toggl profile page. Finally, click continue and you'll have your Toggl account connected to Zapier. Toggl only permits the use of the Tasks portions of their API to users on their Pro plan. If you are seeing this error, this likely means you'll need to upgrade to a paid Toggle plan to be able to access these features. Once upgraded, you should no longer have any issues adding tasks. Toggl requires that date/time entries be submitted in ISO 8601 format, which is YYYY-MM-DD. If your trigger app provides the date in another format, Toggl will try to interpret it. However, if there's ambiguity in how the date could be interpreted (for example, if the date January 9 is written as 09/01, Toggl will default to ISO 8601 and insert the entry on September 1. To get around this, try entering the date/time in your Trigger in MM/DD format. Or, if you're not able to control the way the Trigger provides that data, use a Formatter by Zapier step to re-format the date into YYYY-MM-DD.